just to update a short post to keep my blog alive. had wushu training as usual on wed evening. we learned new stances which is di ba lu. we onli manage to learn abit becos we cant memorise out di qi lu so the coach dun wanna teach us too much. haha. before doin all the stances, we had our warm-up which is running. omg! it's so refreshing cos i din run for quite some time and although it's tough, i was kind of enjoying the process. haha. then before the training end, we had shu zi shun lian and we did push up, sit-up, tucked jump and some other exercise. it was tiring! but it was for our own good at the end of the day. haha. so it was home sweet home after tt. looking forward to meeting darlings on mon for sw's b'dae chalet, goin out wif them on wed morning till noon and then noon will be wushu outing. ok. i shall end here since i have already stated tt it will be a short post. bye! know my results on tues and yes!!! i pass all my modules! i was realli scared when the results were released but out of my expectations, i actually did better for the module which i had least expectations wif than the modules tt i have little confidence in. so it was realli unexpected. all in all, i felt ok wif the results i had gotten. and finally do not need to worry abt taking supp papers. had a refreshing day on wed and thurs! wed nite as usual, had wushu training and we did the usual things. as my legs still hurts, i din really do all the stunts and stances fully and we learn 2 new things tt day. they are qian gun and da ding. im so afraid tt i will break my neck when doin the qian gun so i onli tried once while other ppl tried at least twice. haha. i mus overcome the phobia of doin qian gun!! and da ding is another difficult one. and my back is suffering while doin the da ding. haha. after the normal training and before the training ends, we did shu zhi xun lian and it was tough! and i tou lan while the rest are still doin cos i was at the back. haha. then it was the cake cutting for the sept babies. they din notice tt there were year 1 sept babies too so din celebrate for them. then it was home sweet home. thurs, had a badminton session wif 9 wushu ppl. it was fantastic!!! i din play badminton for quite some time thus my hands are aching now. sob. but i realli enjoy it! hope tt there will be more badminton sessions cuming up! and i realise tt when i hit the shuttlecock, i was using alot of strength and liping say tt the sound seems lyk i was hitting the housefly! omg! and we took 1 pic before goin on our own ways. haha. 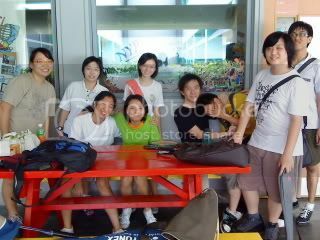 after the 3hrs session, few of us went to koufu and have lunch then off to amk kpool to play pool. i wasn't familiar wif the game so i din play much of it and was there sitting down and watching the rest of them play. we all went home after tt. the nine of us! one of them claim tt he is "camera-shy". haha. it has been 1 week since i blog. although im having my holidays now, but i cant seem to update my blog regularly becos im jus plain lazy. haha. so sorry abt it. went out on sun night wif my family to shop for some stuffs but in the end, we din manage to get any. so i tink it's a waste of money cos im no longer using bus concession now. haha. but i get to have my dinner outside. went out on mon morning to shop wif my family and my aunt spent lots of money! but i din get myself things. then in the afternoon, went to have kfc zinger meal and off to taka for mooncake fair. we are supposed to get 12 mooncakes at lavender booth but sad to say, it's all sold out. so went to home's favourite booth and four seasons booth to buy durian mooncake. i can say it's nice! but kinda expensive. then home sweet home! wed, went for wushu training in the evening. the sports hall is closed so went to netball court for training. then jus normal warmup andthe coach say tt we dun have energy so ask we all to play a game. well, while playing the game, i injured myself again! so suay la! hope i dun hav to rest for another month to get my injury healed. and i cant afford to rest for so long cos i heard tt the grading period is nearing so gotta practise alot. and hope i dun injured myself again cos my mum will ask mi to quit wushu if i get injured once more. pray hard! click the "x" button on the top right-hand corner!